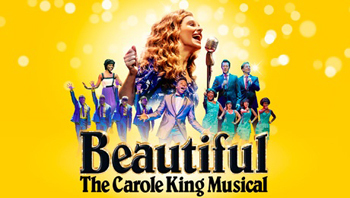 Until being asked to review this Musical, the name of Carole King was practically unknown to me - being just that little bit before my time, and not being a part of my musical grounding at school age. I therefore did what any sensible person should do in this case, and search the Web to find out. One of the great things about my job is not simply that I can indulge in my passion of theatre going and enjoying the spectacles before me, but I also learn a lot too. Before attending this evening's show I watched some 30 Youtube videos of Carole King performing and read her biography on several different sites, and I was quite astounded by her musical output, astonished by the number of songs that I actually already knew, and therefore thoroughly ashamed that I didn't know the name of the person responsible for those seemingly timeless classic creations. The musical Beautiful is a biographical account of King's life and career from 16 year old schoolgirl in New Jersey in 1958, to her solo Carnegie Hall concert in 1971 after releasing her album 'Tapestry' through producer Lou Adler. It's not a ground-breaking Musical, in fact, it is extremely formulaic and conventional in its approach, as the multi-purpose flats and backcloths are used throughout with smaller items of set brought in and out on dollies for each scene; the dialogue minimal, capitalising on and heightening the more dramatic moments of King's life whilst of course the amount of music is at the max, since that is what we have come along to see and hear. Directed by Marc Bruni, this Musical does have a couple of big bonuses on its side however, which other shows of this ilk have not. First, the script is not only very human and easy to follow, it is also extremely funny too, from some very typical Jewish humorous quips to caustic sarcasm. Second, the performers who should play instruments, do, and so many of the cast are multi-talented playing piano or other instruments as the script calls for them to do so. It is slick and seamless, and works extremely well. As we follow King's life from her first big break to her first marriage to lyricist Gerry Goffin, and their turbulent and unhappy times together, to her deciding to go it alone and move to California, we are swept up in cameo performances. 'Neil Sedaka', 'The Shirelles', 'The Righteous Brothers', 'The Drifters' and more, not just of King / Goffin tracks but also from a second song-writing pair who worked alongside King at the record company, Barry Mann and Cynthia Weil. Playing the role of young Jewish girl made good was Bronté Barbé giving a truly outstanding performance. Not only did she look and sound like King, but her subtle transformation from young naive schoolgirl to mature solo artist was actually excellently measured. Playing opposite her as the womanising heel of a husband and writing partner Gerry Goffin was Kane Oliver Parry, whilst their writing rivals turned best friends Barry Mann and Cynthia Weil were played with passion and gusto by the very likeable Matthew Gonsalves and Amy Ellen Richardson. A multi-talented array of cameo roles and ensemble singing took place throughout this show, and much credit must go to these performers too, for bringing to life the recording artists and producers who sang her songs and believed in her. This Musical then is about celebrating, celebrating the life and career of Carole King, whose name ought to have been known by me, and so all hail to this feel-good family-friendly Musical which, by way of playing these songs and telling her story, has educated me and hopefully will do the same to many others too.